This example is very simple, but it presents a fun little problem. How can we map the above into two types, Car and Bicycle, each deriving from a base class Vehicle? The JsonConverter is a helper class which can assist in converting other types than what Newtonsoft.Json comes with out of the box. They basically encompass the process of getting "json object -> .NET object" and back again. We'll be using one of these to map our types back and forth. In the implementation above, we switch the target type based on our reading of the VehiceType enum value. We then use the Populate method from the JsonSerializer to populate our object, as calling Deserialize would once more call our own Converter which eventually leads to a stack overflow . We can adjust this approach any way we'd like. For example we could: Automatically find applicable types by searching the assembly, register our types dynamically through some management system etc. 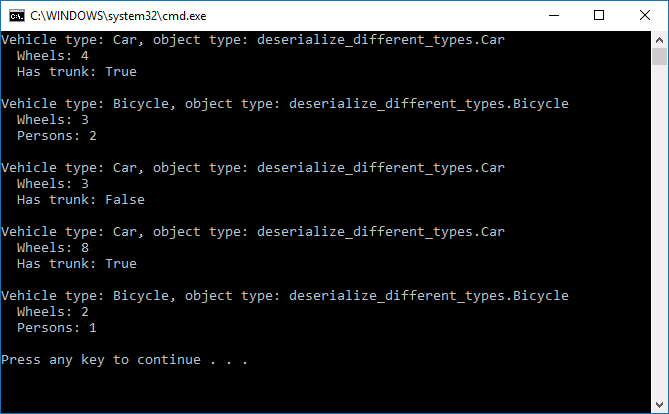 Currently, we can't serialize in a simple way. As with before, if we were to call Serialize directly, we'd end up calling ourselves. There is a workaround though - in my example I've registered the JsonConverter directly on the Vehicle type. If we were instead to implement CanConvert and register our converter with a JsonSerializerSettings object, we'd be able to not use the converter when writing. I've put the source code for the examples above online here: github.com/LordMike/blog-examples/deserialize-different-types.